Verizon did see growth in some key metrics. The Wireless division was again a bright spot as the company gained subscribers. Since merging with Alltel, Verizon has become the nation’s largest wireless provider. Furthermore, the company was able to raise the ever important average revenue per customer for the 11th straight quarter. This speaks to the trend of customers utilizing a data package for the smart phones and blackberry devices that are more popular than ever. Also, Verizon’s FiOS business experienced nice growth and reported record revenue and subscribers. The FiOS division, a still relatively new initiative, definitely has growth potential as it is becoming available to more people geographically all the time, and it has the potential to grab clients from traditional cable and internet providers. The growth in high quality customers (from smart phone users to FiOS customers) helped Verizon improve operating margins by about 350 basis points from last year. These are pretty impressive numbers for an economy in contraction. Their wireline or home phone business showed further signs of weakness. The home phone is on its way out for so many people, as cell phones have customers connected at all times and the wireline connection just seems redundant. With everyone looking to cut out unnecessary expenses, we don’t see that trend slowing down. Although, Verizon did not announce any job cuts in this earnings release (thank goodness, after yesterday), they had previously announced that they would be shrinking the wireline division by 2,700 workers. After the release the stock is off nearly 5% at the time of posting, which suggests that Verizon simply meeting lowered expectations was not all that impressive. 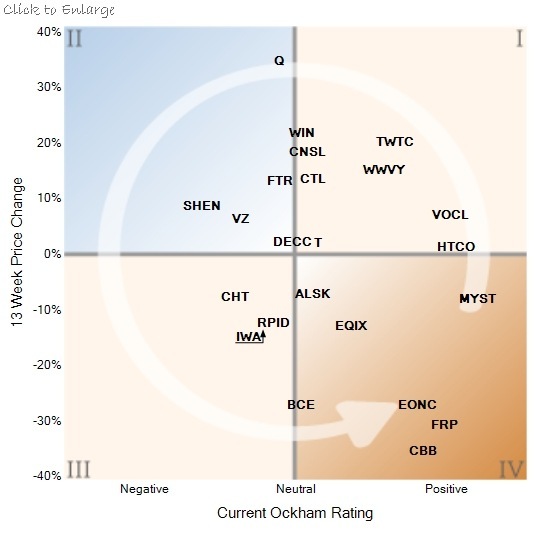 At Ockham, we downgraded our rating of VZ to Overvalued as of this week’s report. The stock is not nearly as cheap as a lot of the other high-quality stocks in this market. 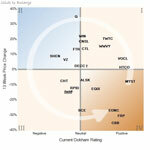 When specifically looking at the telecom sector, Verizon is one of our most negatively rated in that sector. When looking at Verizon currently compared to how the market has treated them in the past ten years, it is clear that the company is not very attractive relatively speaking. Historically, Verizon has brought in a price-to-sales in the range of .63x to .92x, and the current price-to-sales is in the high end of that range at .85x. Price-to-cash is similar; the current 3.81x is even higher than the historically normal range of 2.57x to 3.73x. In this market environment that is saying quite a bit. So, while we see the 6% dividend yield is appealing, we are not willing to overlook our valuation simply for the income portion, and results from the past quarter were mixed.